Yesterday’s Apple event introduced a lot of products, including the new Apple Watch and HBO Now. 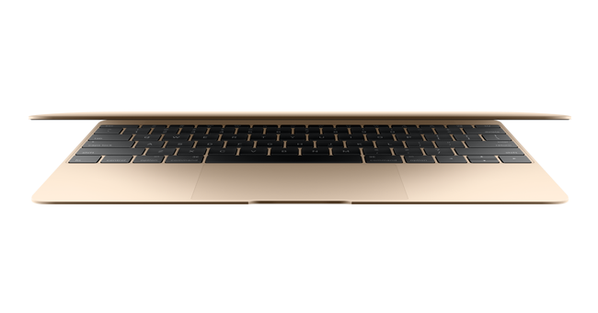 The company also dropped (not literally) the new MacBook, which offers quite a few perks for Apple devotees. And it better, considering the $1,299 price tag. So what, exactly, does that dough get you? Here’s what you need to know. It’s seriously light. Remember when we all thought the MacBook Air was an amazing feat for technology? Well, move over, because the latest MacBook makes Air look absolutely clunky. The new laptop is 13.1 millimeters thick and weighs just 2 pounds. It’s also gorgeous. From the 2304 x 1400 Retina display to the fact that it comes in GOLD, the computer is amazingly beautiful. It’s streamlined and minimalist, with just one USB-C port on the side. Modern has always been the staple word for Apple design, but this laptop takes it to a whole new level. It’s fast, but not crazy fast. If gaming is your main computing need, this MacBook is probably not for you. The Core M processor is great for browsing, word processing, and general computer use. But if heavy-duty computing is required, you’ll likely run into problems. It comes with 8GB of RAM and 256GB SSD, and an upgrade to 512GB SSD will add $300 to the cost. It has a new keyboard. Let’s be honest: Getting used to a new keyboard is not easy. The new MacBook has a redesigned keyboard that’s supposed to make typing easier by better distributing pressure on each key using a “butterfly” mechanism. David Pierce, at Wired, isn’t crazy about it, saying, “It’s not that different from tapping on a touchscreen.” The new design does mean the keyboard is 40% thinner, so if you’ve been really upset about how thick the average keyboard is, you are in luck! It has a longer battery life. This tiny laptop consumes way less energy than earlier models, and the battery is able to last nine hours for web browsing and ten for watching movies, or so Apple claims. During the event, Marketing VP Phil Schiller said that’s a 35% increase in battery life, which is a pretty significant upgrade. Of course, we have a month before the computers are shipped out, so we still have quite a wait before we know what all this means in practice. But still, a super thin gold computer? What’s not to be excited about? !